I am always fascinated when someone says they created a recipe or rather,the new term recipe development.I can never do that for sure.All my recipes are either passed on to me by amma/mil or the ones I read up on the net,books or blogs.I salute those who create a recipe on their own successfully.Thanks to those,we can try them all sans the fear of failure. I seldom deviate from a recipe when I am cooking something--too chicken for that.So it came as a big surprise to myself when I made this Kadai Vegetable which was actually going to be a Paneer based curry. Halfway into the preparation,I thought of adding some vegetables since Ajay isn't too fond of Paneer.Then I thought of making into Kadai veg.Since I was already in the kitchen,didn't feel like logging in to the net and search,so I made it all up--nothing extra ordinary--just the basic ingredients put together with vegetables.I liked the taste immensely,even if I say so myself--very close to this one,in looks as well as taste. So finally,I can say I half-created a recipe too-so what if you can find similar recipes?I cooked it without peeping into a book or my laptop--that by itself is satisfactory to me,hehe. Make a paste of onion,green chilly and ginger garlic-reserve. Boil about 4 cups of water with a tsp pf salt and a pinch haldi-when it comes to a rolling boil,add the vegetables except capsicum and cook for 3-4 minutes. Strain and wash well with cool water-keep aside. In a kadai add oil and splutter jeera-when it pops,add in the onion paste. Saute for about 3-5 minutes. Add the tomato puree,mix well and close with a lid-as it would splutter a lot. Now add the masalas - red chilly powder,cumin-coriander powder,garam masala and haldi. Add salt to taste and stir for a minute or two. Add the kasoori methi,paneer and capsicum. Add the rest of the vegetables and give a good stir. Add about a cup of water and simmer for 5-7 minutes till the curry thickens. 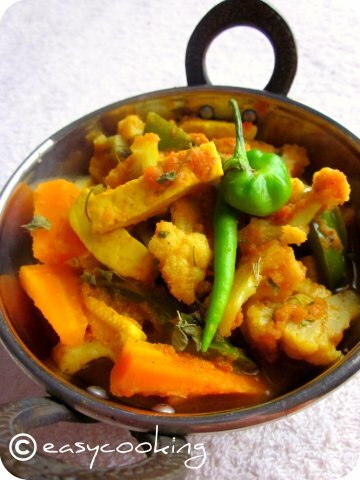 Serve hot with rotis or pulao. my husband too is not fond of paneer as he has milk intolerance. love your veggie version Divya. will make this for dinner tonight. 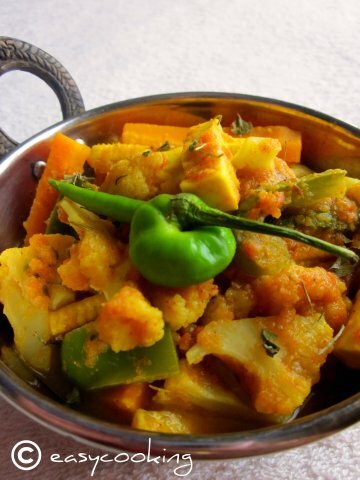 Lovely kadai vegetable...looks colourful and yet so yummy. I actually loved the kadai in which you have the subji in!!! 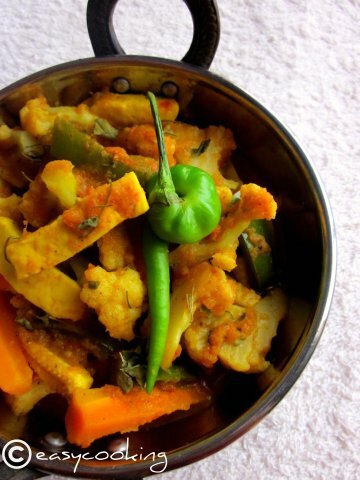 Woww wat a droolworthy kadai vegetable, looks fabulous.. I love Kadai veg...its one dish i alwayz order in a restaurant but its never satisfying to eat d oil-floating gravies..Urs looks so healthy n delicious..Sure to try it out...Glad im following u!! I love kadai anything. I think its very gourmet. Lovely clicks and beautiful assortment of veggies, Divya.